For my first night without premium, I returned to Minecraft. 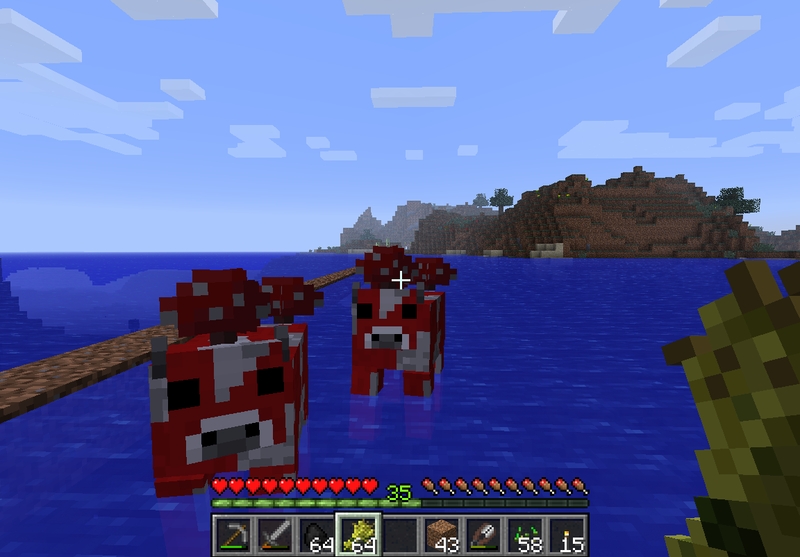 I settled in to the boring rhythm of keeping the Mooshrooms moving towards my base. We crossed two oceans and made it back to the home landmass. I was really bored, and irritated, with the whole thing – they just move way too slowly when swimming in particular. And then a little lake that I was crossing drowned one of them, after getting them both safely through over 10,000 blocks. I was crushed. And immediately gave up on the whole project, abandoning the remaining Moosh and running back to my home base. Next project – powered rails towards the Mooshrooms. Can you get a cow into a minecart ? It’s worth a try I believe. 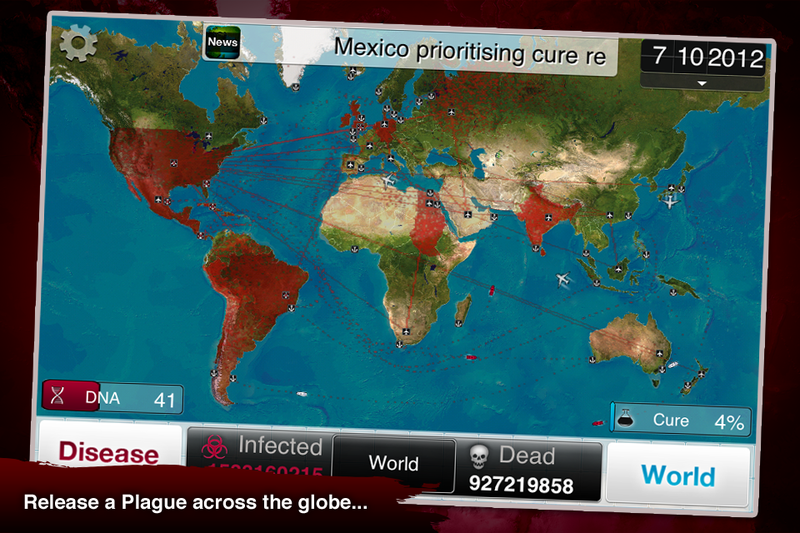 I’ve found the ultimate strategy for Plague Inc, and I suspect it works all the time and very easily. The trick is, most of the time when I lose, it’s because humanity has researched a cure. And you can’t be too deadly, or you’ll kill off all the infected people and leave some healthy ones. So the simple idea is never to be noticed. Humanity will not detect the plague (I think) if you have no symptons. It certainly worked with fungus and with parasite, at least. So make the disease infectious until you penetrate each country, then wait until all humanity is infected. Go for Total Organ Failure immediately (with saved up points) and watch humanity die. I spent the rest of the evening messing around with Steam and played several games for a few minutes each. I noted that if Valve were smarter and displayed some kind of aggregated achivements mode, I would probably be playing more games longer. But my number of achievements lives within each game’s page only, kind of ruining the fun. Pretty clearly, I’ll be back to tanks soon. Memorial day weekend for sure. Could not put down the Plague last night. Normal games introduced a bit of extra difficulty that resulted in frustration no matter which way I took the game, it seemed. Step hard on the cure ? Then the infection doesn’t spread everywhere. Step hard on the lethality of the disease ? The world figures out its problem too soon, and researches the cure. Or everyone dies leaving some frustrating survivors. Canada was the new world superpower once after I wiped out most countries, leaving them with Greenland and a few collapsed, anarchic middle-east countries. So of course I went onto the web looking for a strategy, and I found one. The key was not that complex – a question of tactics and not strategy. Its important to transmit the disease, but keeping it low key and using planes and ships at first, all the way up to Extreme Bioaerosol, hit most of the world. After that, it was about using infectious symptoms and some additional transmission to infect every country in the world. Notably, ignore blood and insect vectors. What’s nice about finding this game is, at last, a deep strategic experience on a smartphone. Talk about a good platform – I can make a few moves between daily tasks, or just veg out for 20 minutes in the middle of the workday. This beats Zynga wordgames, for sure. Every time I’ve searched for such things I found no useful website, and searching in the market ? It is to laugh. I’ve now unlocked the next harder disease – a virus. I think it’s harder – only makes sense. And presumably winning with the virus will unlock the next one. For the moment I’m going to continue winning games on normal, and unlocking more of the “bonus abilities” that you can start the game with. I did several daily doubles, so the grind continues for Tanks. There’s a week left for my premium account, and we’ll see when it expires if I feel like blowing another 2500 gold on another month. It’s not like I don’t have other games I’d like to play – Plague Inc, Minecraft (the great Mooshroom drive must be finished), something on Steam, Carmageddon. With about 15m credits banked, I continue to be well-credit-funded and not stress about the VK4502P games, so premium doesn’t feel like a requirement. The weekend special, with multiple +X% credits and double training, leads me to believe it’ll be more of a low tier time, which is fine with me. At least, until I recharge the mobile and resume trying to wipe out the world. Sometime back I remember playing a free web game about a disease that kills everyone on the planet. It was fun, with the annoying bug that you couldn’t kill anyone in Madagascar. Then I heard yesterday about it’s spiritual successor, called Plague inc. I downloaded and found myself playing a lot of it overnight. The plot is a bit of a twist – you are the disease. You want to kill every human being on the planet; or perhaps just everyone in Madagascar. As time goes on, you infect more and more people, start to kill, and will know the victory of destroying all human life, or failing by not doing so. What makes the game fun are the decisions you make regarding how to mutate your virus. You select various attributes focused around deadliness, infection rate, disability, and special abilities. Evolve your virus the right way, and it could kill everyone. My first game, I had experience with Pandemic, but not this specific game. I simply played without thinking much – use up all the DNA points that you gain, quickly, and see if it works on Casual Mode. I started in India and while I managed to kill around 80% of the worlds population, they found a cure and eliminated me. Second game, I focused on being better at getting people sick. The infection spread faster but was still deadly – too deadly. I managed to kill off everyone who was sick, before the disease could spread to all humans. Fail. Third game, I thought about the difference between wealthy and poor countries. The game warns you that you won’t spread very fast in a wealthy country with good healthcare. Well I said, screw it, let’s start in Japan anyway, focused on being an annoying virus that doesn’t kill anyone, and infected the whole world. Then I made it deadly, and all of humanity was destroyed. Win game. It’s a lot of fun, and the minor grinding elements they’ve added are smart. You start as a bacteria only, but if you can beat the game on Normal mode, you get to try various other bugs. You can also unlock various buffs to your base virus. Well worth the $1 I had to spend to buy it. Next time, I’ll try again to win on Normal mode. Hopefully I’ll do better than last time on Normal, where I wiped out the population except for Angola (!?? ), which defeated me by finding the cure..